Sorry I didn’t post a grocery list this week. I would’ve posted it today, but Urban Organic already updated their list and they didn’t include a newsletter in my box. 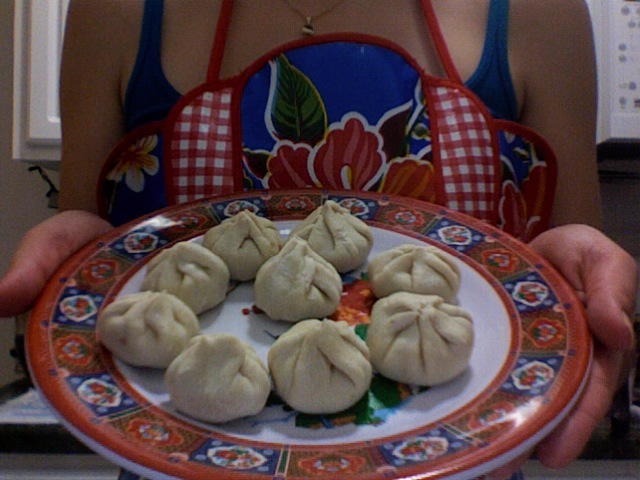 But here’s the recipe for the momos I made this week! It was so much fun, but took forever. My little steamer only fit 6 dumplings at a time. And she says they’re Nepalese dumplings, but I actually first heard of momos in a Mediterranean restaurant. Weird. Note: I went out and spent my Bed Bath & Beyond gift cards to buy a steamer, a pastry mat (I got mine for $7), and baby tongs. You’ll need the steamer, a pastry mat, and a rolling pin to make these. THEY'RE SO CUTE! also, the color scheme of the plate matches my apron. awesome.